Couples ought to think and plan for retirement differently than single folks do. By making retirement decisions with a joint outcome in mind, money can last longer and both spouses can look forward to a more secure retirement. Here are five areas where couples may need to readjust the way they make retirement decisions. Many couples think in terms of “my money” and “your money." One spouse may invest their retirement money quite conservatively while the other spouse takes a more aggressive approach. One spouse may contribute the maximum amount to retirement accounts each year, while the other spouse contributes only a small amount. 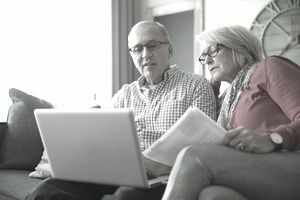 There are valid situations, such as second or third marriages, where each half does need to look at their assets as their own, but in general, when planning for retirement, most couples will be better off by taking a household view. For example, what if your retirement plan offers low-cost index fund investment choices and your spouse’s plan offers a great fixed account option? By coordinating efforts as a household you may achieve a better outcome than selecting investment options independently of one another. The odds are high that one or the other of you will live longer than you may think. You need to plan for this. Although it can be difficult to have discussions about life expectancy, it is important to do so. And if there is a large age gap between the two of you, this must be factored into your distribution plan. How do age differences affect your planning? One of you may have to begin required minimum distributions from retirement accounts many years before the other. This would naturally lead to a different investment approach in the account that must be used sooner. In addition, if one is younger and may live longer, it may make sense to buy a deferred income annuity in an IRA account of that younger spouse. Health differences also matter as they affect your need for long-term care, your choice (and cost) of health plans, and the types of activities you engage in during retirement. It is hard to turn down a lump sum of money. Many retirees cash in a pension plan thinking that it will be better for them to have the money available in an account rather than paid out to them as an annuity over their life. This is often not the best decision. You can calculate the rate of return that you would have to earn on investments to deliver the same income the annuity option offers, and in many cases, it would be very difficult for you to achieve an equivalent rate of return. Be cautious of advisors who tell you they can “do better” than the pension plan. Single life vs. joint life options matter too. Here's one example of a big mistake: A corporate exec in a second marriage chose a single-life option on his pension (meaning the benefit stops when he dies) and at the same time made his wife the beneficiary of his IRAs. He passed away about 18 months into retirement and his $6,500 per month pension benefit immediately stopped. It would have been better for all parties if he had chosen a joint life option that continued the pension to his current wife and left the IRAs to his sons from his previous marriage. It is normal to have one spouse who is the primary decision-maker. The other spouse is often not comfortable making big money decisions or may not have the knowledge or skill set to evaluate investment options or complex financial transactions. How will the less sophisticated spouse handle things if he/she loses their partner? Will they be able to manage a large sum of money, or know how to select the appropriate person to do so? Older Americans have become targets. How would your spouse handle a sales call or pressure from someone who may be using scare tactics, or “friend” tactics to propose something completely inappropriate? Have honest conversations with your spouse about this and see what steps they would like to take to make sure they are in good hands if this situation occurs. Social Security benefits have a built-in form of life insurance for married couples called a survivor benefit. With a little bit of planning, you can usually get a higher benefit amount from the person who made the most income, and that higher benefit amount will continue for the life of the longest-lived spouse. In addition, in many cases, a lower-earning spouse can collect a spousal benefit for a few years while waiting for the higher earner’s benefit amount to begin. Because of all the choices available, before claiming, married couples need to look at how their Social Security benefit choice affects the other and how it affects the household as a whole. It takes communication, but as a team, you can achieve a better outcome by planning together. 7 Outdated Retirement Decisions - Are You About to Make One of Them?